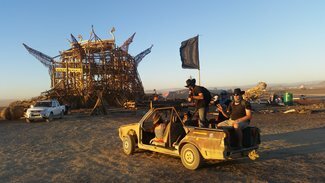 Loved AfrikaBurn? Not ready to return to the real world just yet? Extend your stay in the Tankwa and help our Leave No Trace team tidy up once the dust has calmed and everyone has departed. Shelter, food, beer and a really fun time are part of the gig. Working with our DPW crew is always a hoot. Remember, Leave No Trace is one of our 11 Principals. We are committed to leaving the desert as spotless (in fact, usually even more spotless), than we found it. Matter Out Of Place (MOOP) is everything that doesn't belong in the desert. Think sequins, glitter, stompies (cigarette butts), onion peels, flow bins, wood chips – ANYTHING that doesn't occur naturally in the Tankwa. Sign Up for as many days as you'd like. If you stay for ten or more days, you will also earn a stipend, as well as our long lasting love and appreciation.